Rodolphe Kreutzer was born in Versailles and was taught by his father, a musician in the royal chapel, and by Anton Stamitz. He became one of the greatest violin virtuosis of his time and gave solo perfomances until 1810. He taught the violin at the Conservatory in Paris from 1795 until 1826. At a certain time he directed the Paris Opera and he was a conductor there from 1817 onwards. In 1798 he had met Beethoven when he worked for the French ambassador Bernadotte in Vienna. Beethoven dedicated his Violin Sonata no. 9 in A major to the violinist George Bridgetower, but after a quarrel he rededicated it to Kreuzer. But Kreutzer declared it unplayable and never performed it. Kreutzer himself was the composer of forty opera's and nineteen violin concertos. He died in Geneva in 1831. He was buried at the Cimetière de Plainpalais, but his tomb has disappeared. There's a cenotaph for him at Division 13 of Père Lachaise in Paris, where his wife was buried. Unfortunately her grave was cleared in 1995. 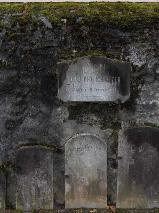 The gravestone of Rodolphe Kreutzer is attached to the wall of the Cimetière de Plainpalais, Genève. 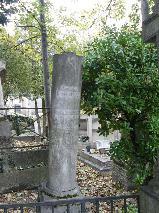 Cenoptaph for Rodolphe Kreutzer at Père Lachaise, Paris. His wife was buried here but her grave was removed in 1995.